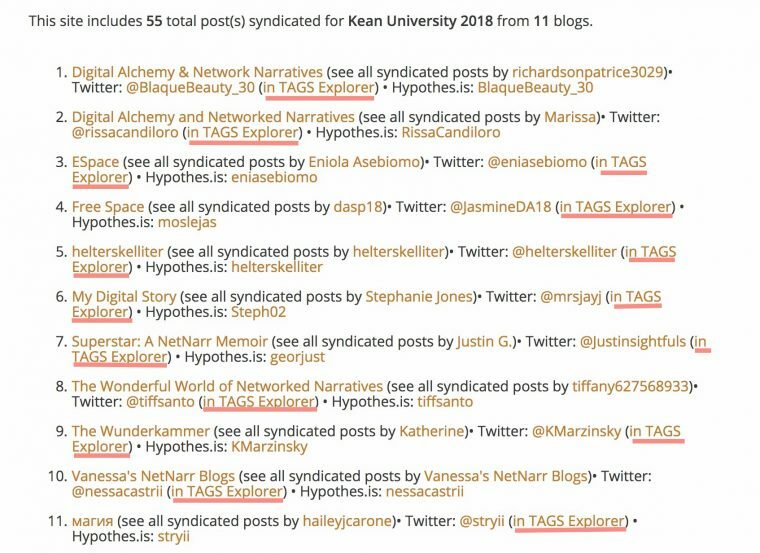 I’m a huge fan and repeat user of Martin Hawksey’s Twitter TAGS. If you are doing a class or project with activity around a hashtag, and you are not using this tool, just stop everything and set one up. It’s rather brilliant, a Google Spreadsheet with some Hawksey-ian script genius underneath. It archives all tweets it finds, but yawn archives. The real value is the summary data, the top tweeters, but the best, best is the visualization of all activity as a giant throbbing blob (that in most cases of activity usually forms a shape of the DeathStar. 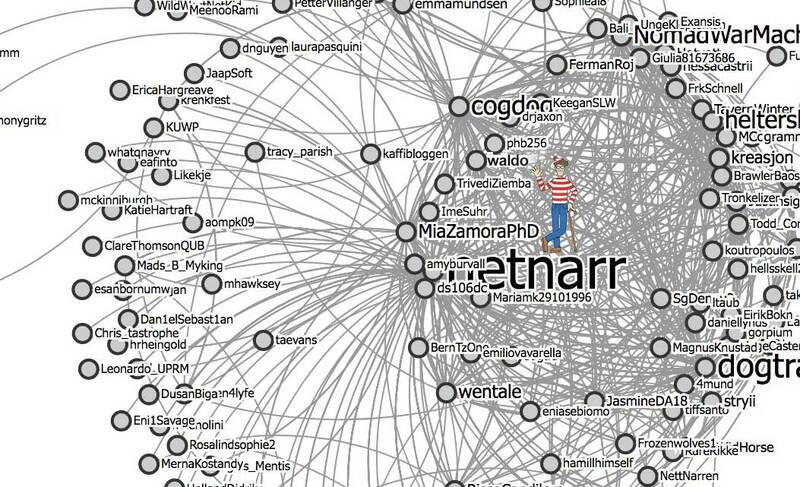 Data for one over eager user of #netnarr. You can watch it play back all of the connections and you watch the formation of one person’s activity. THAT is pretty freaking amazing. And I feel like I am the only person that every even looks at it. But now my students will– because I want them to find, see, and write about their own activity, and connections with others via twitter. I want them to examine where and how they are in the conversations. I asked Martin if there was a way to generate a URL that would direct link to the Conversation Explorer with a node open. As usual, he responded in about 10 minutes, and it is crazy easy. The first thing I did was fold this into my code on the netnarr site that generates a blog list for a Feed WordPress set of blogs. Without piling on too much code, this is done by a shortcode where I pass the category ID that includes the feeds, and now a new parameter that provides the URL of the Conversation Explorer (my signup form requests a twitter account, and that too is stored on my site with the feed data). 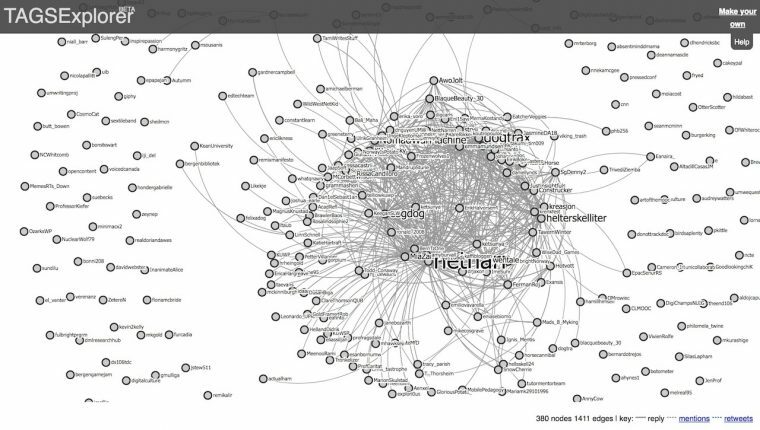 I can now ask them to find their own place in the Twitter TAGs Conversation Explorer and analyze their own activity. But what about the plugin? Hold on to your hats, Earl. So I wrote some custom code to generate the links, and I could ask people just to edit URLs, but… I wondered if I could create a plugin that would be able to insert a lookup form. 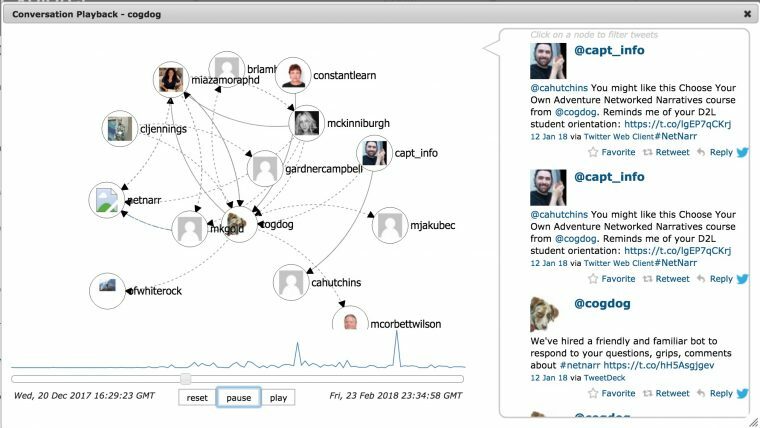 where url` is the link from your own Twitter TAGs worksheet for the conversation explorer. Twitter names do not need the @ sign; if present it will be truncated. 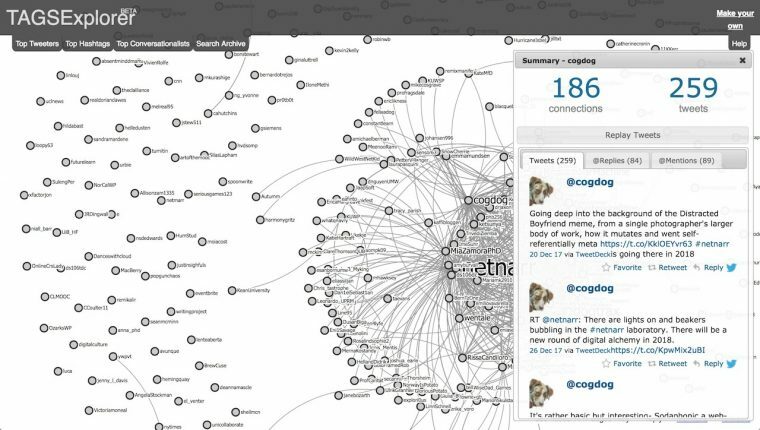 The Conversation Explorer will open in a new window, and the info for the twitter name opened (if it exists in the yarn ball). It’s one thing for Waldo to tweet your hashtag, but now you provide him the means to find his own activity in the Big Mess. That’s too ironic, Martin! Wondering if you could add a lookup column in the Summary listing? Or a query box in the TAGS explorer itself? And you are far from the only one talking about Martin’s brilliant invention. I talk about it all the time. I featured it in my talk at Plymouth State, with an ending you might have recognized from NMC days. It’s a huge deal in #openlearning18. I’ve even learned a little about how to operate it myself—not on your level of course, but reasonably ok for a complete novice. Martin has also set up a good forum to support the use of TAGS. Smart guy, that Martin.